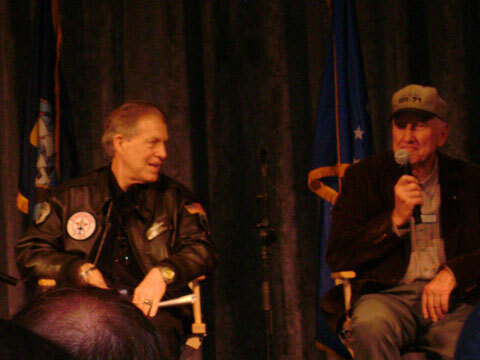 Morale Entertainment announces the "Legends of Aerospace Tour" including famous aviators and astronauts to visit our military March 3-13, 2010. Confirmed participants include Neil Armstrong and Gene Cernan, the first and last men on the moon, Capt. Jim Lovell, Commander of Apollo 13, Bob Gilliland who was Kelly Johnson's Chief Test Pilot and the first man ever to fly the SR-71 Blackbird and Ret. General Steve Ritchie, the only Air Force Pilot Ace since the Korean War. 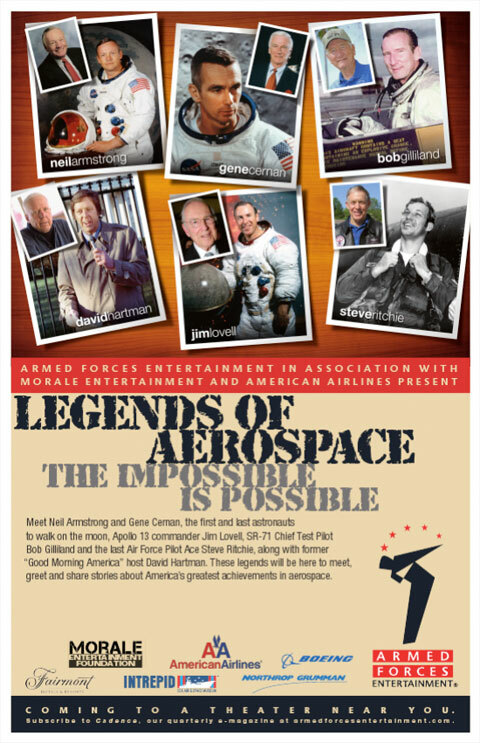 Also traveling with us on the "Legends of Aerospace Tour" will be two outstanding media legends: David Hartman, first host of "Good Morning America" who will be our moderator for panel discussions on each base and on an aircraft carrier in the Persian Gulf and Jeffrey Kluger, who wrote the book with Jim Lovell that Ron Howard used to make the movie Apollo 13. He is currently a Senior Writer with TIME Magazine. 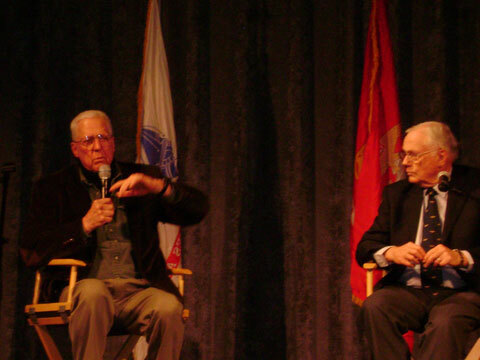 During the tour, 20-40 minute panel discussions will be conducted in auditorium settings on Air Force Bases and a ship at sea, hosted by David Hartman. A video will be played that introduces each of the panelists. These panel discussions will be followed by an opportunity for meet and greets, photographs, etc. "Teaching" break-out sessions for individual legends are being organized. The Tour will log 15,000+ flight miles, meet with 10,000+ troops, give away thousands of items, give motivational speeches and panel discussions and have numerous meet and greets with our troops. One of their stops is at the Intrepid Sea-Air-Space Museum. Intrepid event sounds fun. I might try to go to NYC that day. Armstrong is the only moonwalker I have never met so I can hope there will be a chance to shake his hand. We have autographed flyers on our website. There has not been any confirmation yet whether the astronauts will be signing autographs on site. - This from the Intrepid museum. How long 'til those "autographed" flyers make it to eBay? I was on the Intrepid Saturday, and someone mentioned Armstrong was coming, but he had no further info he could divulge. Since I'm an Intrepid member, guess where I'll be Saturday! Finally to be, at least in the same room, with Neil!!!! This event sounds wonderful. I'm happy for any NYC-area folks who for just $24 will get to attend an event, including Q&A, with Armstrong, Lovell, Cernan, and others. I'd also like to say how much I admire the Legends of Aerospace Tour participants- they are on what has to be an exhausting 15,000-mile trip across Europe and Asia to raise troop morale. And the astronauts are around 80 years old. When I'm that age I'll be happy if I can go on an exhausting two-block trip across the park to raise squirrel morale. This has been an ongoing event? Anyone know if the astronauts did a meet and greet type event at other locations? I suspect at the Intrepid maybe there would be too many people. But if there's a chance to meet Armstrong I figure I should go for it. I know I won't get an autograph but just shaking his hand would be an honor. This has been an ongoing event? The Intrepid event is the tour's homecoming and the only one that was/is open to the general public. As the press release that starts this thread explains, the tour went overseas to visit Air Force bases and "a ship at sea," which included "meet and greets," but that was in support of the troops they met at each stop. I would expect the Intrepid event to be more presentation than interaction, if only because of the logistics of the venue. Fox News just showed a segment of our astronauts on tour at overseas bases. It was a great news clip and these astronauts are true heroes bringing morale to our troops. Our troops need our support!! As a former soldier and combat veteran I know how important these shows are for our men and woman in uniform. Thank you. Linda and I were U.S. at their appearance at Air Base RAF Midenhall in the UK! It was great seeing all five of these true heroes in such good shape! Worth sitting on the floor for two hours! Unfortunately this weekend's forecast monsoon rains will be keeping me from going to the Intrepid event like I had planned. If it rains as hard as it is forecast to, I wonder if they will still land on the flight deck in the chopper. For those intending to attend the Legends Tour at the USS Intrepid, the weather for the New York tri-state area calls for rain. In fact, flood warnings. This information may have an effect on the program itself. As a museum member, my information was that the guests of honor were to arrive by helicopter on the fantail of the Intrepid. A picture of that alone would be worth the effort to attend. Just spoke with a representative of the Intrepid, and he indicated that as of now "all plans remain the same... however there is a possibility that the crew arrival by helicopter can change due to weather." A friend and colleague of mine, Tariq Malik from Space.com, is at the Intrepid for today's tour homecoming where he is reporting that the poor weather has already delayed the astronauts' arrival and is threatening to cancel the event altogether. Update: The event was canceled after the plane carrying the guests of honor was diverted to Boston. The museum is going to try to reschedule for Sunday morning. They can come spend the night at my house if they want. The homecoming tour event is now confirmed for 11:00 a.m. today (Sunday) at the Intrepid. Sorry to hear weather caused a cancellation. The bad forecast was one reason I decided not to make a day trip down there. Did it eventually happen Sunday morning? I look forward to seeing any photos. Initial delay getting into the museum as the security gates had to deal with various cub scout troops bringing packs and sleeping bags to spend the night on the hanger deck. Learn that the tour made two aborted landing attempts at JFK before being diverted to Boston. Steve Ritchie provides a few more stories and kindly offers to remain around the hanger deck and speak with people. Neil Armstrong never mentions either his X-15 flights or either NASA mission, but does make the important note that people should make an effort to educate themselves on the two current conflicts so that they can have informed opinions. In a near hurricane I made the two trips to the Intrepid as well. I nervously watched as they removed two of the chairs from the podium before the presentation, praying that at least Neil was there, and yes he was. Bob Gilliand spoke a bit, technically at first, confusing to much of the crowd (I'm a USAF vet so it was okay to me), and then soon charmed the audience who found him "grandfather like." He was a big hit. 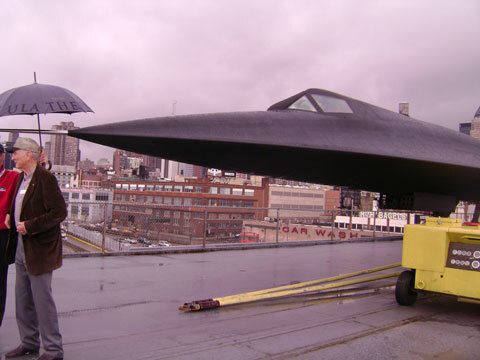 He later went up on deck in the rain where we all hid under the wing of the SR-71 he used to fly, while he reminisced. I could listen to him all day! Neil, as previously noted, said the least, he seemed somewhat uncomfortable, but it was amazing to actually see "the man" in person, it alone made the trip worthwhile. David Hartman did a fine job as host. The big surprise was Steve Ritchie, who after he spoke, offered to hang around and give a talk. The entire audience left after he signed a few signatures so me and my wife, and two other fellows went with Steve to the auditorium while they announced he was going to speak over the ships loudspeakers, and a few stragglers joined us, mostly seeming to wander in while waiting for the next movie to start. It was not an organized affair and many people missed out but I was willing to wait as long as it took. He made it clear he was prepared to speak to just the four of us if no one else showed. He gave a FANTASTIC talk, covering patriotism, dog fighting, preparedness, terrorism, physical fitness (he does 400 push-ups a day), flying fighters, his friendship with President Reagan, the flaws of big government, leadership, and the future of the USAF. Even my wife, who is a bit more liberal than the General, said he was inspirational. He answered all questions, posed for all photos and shook all hands. Neil Armstrong, the first man to walk on the moon, touched down in rainy Manhattan Sunday and urged the public to take a more active interest in the military conflicts facing the United States. Armstrong, 79, spoke to a crowd of more than 1,000 people, including Cub Scouts and other young children, who gathered at the Intrepid Sea, Air and Space Museum here to welcome the famed Apollo 11 astronaut and other aerospace legends home from a tour of military bases in Europe and Southwest Asia. "I hope that all of you, and all of those with whom you came, take an interest in the conflicts in which our nation is involved," said Armstrong, who received a standing ovation from the crowd. "Become informed about the importance and the reality of this major commitment of our society, so that you can feel like you personally know enough that you can have an opinion about it." 100 people? Very disappointing turnout, you can get that for a tv morning show outside Radio City Music Hall. Bad weather, they should have rescheduled a future date when all three could get there, $22 not worth THAT! According to Space.com's Tariq Malik (his article is cited above), there were more than 1,000 people there on Sunday, about half as many who turned out Saturday before the weather scrubbed the original schedule. I am not sure if the number hit 1000 on Saturday, but it was not there on Sunday. The Intrepid set up chairs for museum members and guests and as a rough estimate, there were 500 to 750 chairs (probably closer to the latter). On Saturday, the chairs were full and there was standing room behind them that ran one or two deep. On Sunday, there were plenty of chairs to be found for sitting. The presence of Cub Scouts staying overnight (as well as a number of other student groups) helped drive up the number. 1000 people for Sunday sounds high. 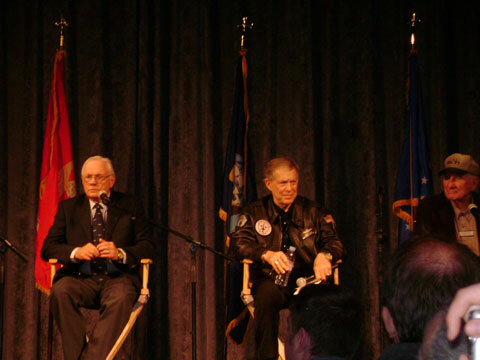 Morale Entertainment announces the "Legends of Aerospace Tour" including famous astronauts to visit our military October 7-13, 2010. 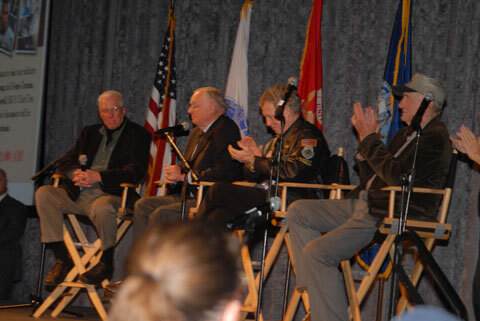 Confirmed participants include Neil Armstrong and Gene Cernan, the first and last men on the moon and Capt. Jim Lovell, Commander of Apollo 13. Also traveling with us on the "Legends of Aerospace Tour" will be an outstanding media legend, David Hartman, first host of "Good Morning America" who will be our moderator for panel discussions on each base and on an aircraft carrier. During the tour, 20-40 minute panel discussions will be conducted in auditorium settings on Air Force Bases and a ship at sea, hosted by David Hartman. A video will be played that introduces each of the panelists. These panel discussions will be followed by an opportunity for meet and greets, photographs, etc. I thought back in March that it was so admirable of these men, who have already done so much for our country, to take the time to go on an exhausting trip to raise troop morale. And now they are hitting the road again! Amazing. 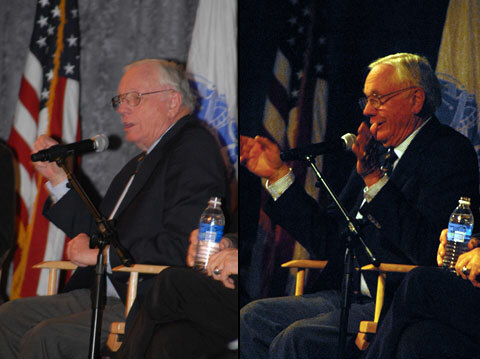 Neil Armstrong, Gene Cernan and Jim Lovell are at Joint Base Balad in Iraq today for the Legends of Aerospace Tour. My parents just sent me the Fall issue of the USO's On Patrol magazine, which features a nice Q&A article on the recent "Tour of Legends" taken to visit US servicepeople overseas by astronauts Neil Armstrong, Captain Jim Lovell, and Captain Gene Cernan, as well as the first pilot to fly the SR-71, Bob Gilliland, and the USAF's first ace of the Vietnam War, Brigadier General Steve Ritchie. Thank you, gentlemen. For everything. Somewhere Bob Hope is smiling. An outstanding article and makes me proud of the legends and the troops they went to inspire. They ended up being inspired in return. 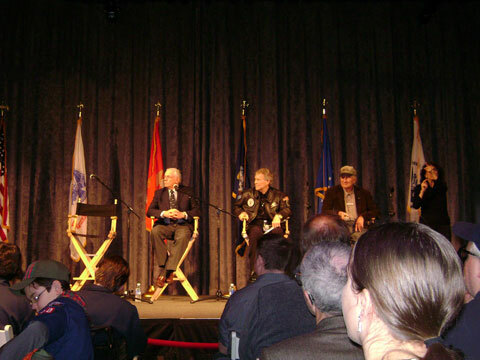 Neil Armstrong, Gene Cernan and Jim Lovell are back on tour, as Reuters reports the three are in Afghanistan this week. Neil Armstrong, the first man to land on the moon, jetted into Afghanistan this week with two other lunar greats to give a much-needed morale boost to the country's struggling air force. The 81-year-old American, who became a global sensation in 1969 when he became the first man to set foot on the lunar landscape, met Afghan officers in training at Camp Eggers in Kabul, the headquarters of the NATO-led training mission in Afghanistan. "Passion is important in every occupation," the bespectacled Armstrong was quoted by a NATO statement as telling a small group of Afghan Air Force trainees, who were shown in coalition pictures wearing camouflage. "It's encouraging to see this young group's enthusiasm and excitement," Armstrong told the small, eager crowd, with women clad in black hijabs and men wearing green berets. On August 17th, 2011, three Apollo astronauts visited troops at Camp Dubs, Afghanistan. Continue watching parts 3, 4, 5 and 6 on YouTube.